I have often scoffed at the images that emerge from the annual Black Friday melee, marking the beginning of the Christmas shopping season down in America. 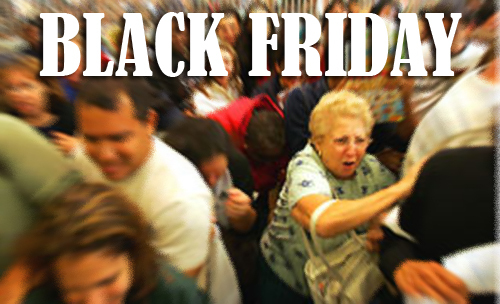 Scores of people line-up at their friendly neighborhood retailers to take advantage of the door crasher specials offered as loss leaders, to ignite the shopping flame that burns insatiably till the dying minutes before they finally lock the doors on Christmas Eve. The materialism, the lust for stuff, the get-it-at-all-costs delirium has always sickened me, to be completely frank, which is why I was a little disappointed in myself this morning. Every year, on a weekend shortly after the kids return to school, the Fort McMurray Public Library holds its annual book sale. I saw the tweet early this morning and discovered that I had a Pavlovian response to those two sweet words: book and sale. My pulse started to race, the surface of my palms began to glisten, my mind raced ahead to the stroke of nine when the literary offerings would be up for grabs at the low price of 25-cents per item. Ben and I arrived at about 9:10, the u-shaped set-up already swarming with activity, boxes lining the tops of tables with additional treasures underneath. He dived into the non-fiction side while I wiggled my way into the novels section. Thumbing through the titles I notice someone to my left, standing like a sentinel, waiting for me to move so they can slide right in - they stare, they pierce, they pounce. I move clockwise as the hovering mob seems to be moving in that direction, slowly, like swimming in a pool of molasses. The intensity is incredible, as good-as-new copies by Patterson, Collins, Binchy and myriad other authors, get snatched up and added to the growing piles in the crooks of arms, too numerous to count. "I'd better cash out," I said to Carolyn, sitting behind the table where we fork over our collection of loonies and quarters. "That will be three dollars," she said. "Would you like a bag for those?" "Yes," I replied. "Yes I would. Thank you." Books safely ensconced in my new-to-me bag, I couldn't resist one final sweep through the most promising boxes. "Just one more look around," I said to Carolyn over my right shoulder as several openings in the feeding frenzy appeared and I took one final swim through the literary pool.